I have been planning on putting together a few posts on body language for quite some time now. This topic is exceptionally important in any business / environment. The knowledge and understanding of body language is essential to any kind of communications, and when it comes to negotiations, conflict resolution, dealing with difficult people it is absolutely critical. There are many books and studies written on this topic, there are some simple common sense techniques, there are more advanced and powerful ones. In general reading and using body language is not a trivial task and the complexity of it goes up tenfold when you find yourself working with people from different cultures. But did anyone say that offshore was easy? Anyway, I am not yet ready to cover this topic – still doing some research and compiling my notes and materials I gathered over years. The reason I decided to mention it today is not to put a stake in the ground, it somewhat a comical one. A few minutes ago I saw a picture of Illinois Gov. Rod Blagojevich on yahoo news. The body language in the picture stroke me as a classical stance of well trained used car salesman – “Would I ever lie to you! ?” So I could not resist the temptation to put it here and ask you for ideas of a caption for the picture. Placing an outsourcing contract, scoping a fixed bid development project, making a substantial change in the engagement scope, resolving conflict on quality of service or project deliverables… all these activities require negotiations, sometimes rather involved and lengthy. One of the first steps in business negotiations, the one that often sets the tone of the negotiation is initial discussions. Even small scope negotiations can benefit from initial discussions being a stand-alone step. I view it critically important in many regards, one of the most important being assuring that you “do not react but respond” – deal with the issue in the most constructive manner. Let’s consider a situation when your offshore partner just announced that a key employee is leaving the team. Instead of hitting the roof and screaming in a phone that this just the final straw and heads will roll you may want to hear what the vendor has in mind in dealing with the situation, chances are they may have a plan. Listen attentively and take detailed notes. Separate people from the problems. Position (now you can say that you can’t take it anymore). Selected constraints. Your true situation might have more complex structure and constraints from what you are prepared to share with you opponent. Introduce negotiation team. That is typical for more formal / complex business negotiations. Confirm negotiation authority. That is not a bad thing to do even for small negotiations; it is required for comprehensive / formal ones. People involved in the negotiations, their style and skills. Your opponent situation and perceptions. Interests, goals and objectives behind their position. Additionally, initial discussion will give you a chance to establish rapport with the members of your opponent’s negotiating team. This is critical success factor of any negotiation, as a matter of fact the more complex and more confrontational is the negotiation the import important is to establish rapport. It is in particular important for cross cultural negotiations. Listen twice as much as you talk. A lot is written about active listening and it is still one of the most underappreciated skills. Stay with the game plan. Avid confrontation… unless it’s the game plan. 1. No reasons to outsource. Let me clear a suspected circular reference here: take a look at my earlier posts Top reasons for outsourcing and My reasons to outsource; if your reasons for outsourcing are not listed there and more so after some reading and thinking appear to be superficial, they probably are. 2. Personal. 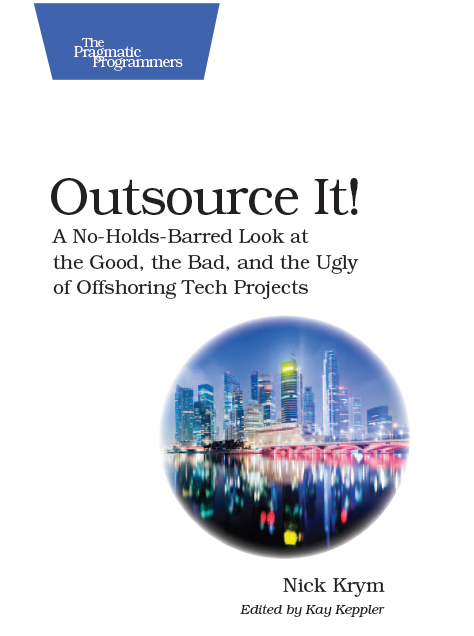 If you do not believe in outsourcing, if it could present a clear and present danger to your career, or outsourcing is likely to affect your life in some tangible negative manner (take a look at Offshore Risks: Team and Personal Impacts for some hints) stay away from offshoring as far as you can. 3. No executive support / sponsorship, no organizational / team support. If you running and uphill battle in your organization – your execs do not believe outsourcing is beneficial for the organization, if getting appropriate funds is questionable, if your team doesn’t support you. Well, maybe you are agent of change, yet still, you need to pick your battles. 4. Low risk tolerance. Your organization / your boss / yourself do not tolerate risk well and have high penalties for mistakes. Trying offshoring in environment like that is a very risky proposition. 5. No appropriate opportunity. There is always a risk in applying such a powerful yet delicate weapon as outsourcing to tasks that are not made for it. And there is not much use of trying to fit square pegs in round holes. 6. No offshore-ready management resources. If you and your management team doesn’t have any experience with outsourcing you might be better off without it unless you are mentally and financially ready to sustain a lot of pain. 7. No processes. If your organization is process free or still straggling to achieve CMM1 inviting outsourcing is likely to cost you an arm and a leg, so stay away from offshore, unless of course you’ve got spares. 8. You need to cut costs, now. Properly handled and with a bit of luck offshoring is likely to show some cost savings, yet as they say it takes money to make money. Your need to invest before you realize the savings. So if your need to immediately make up for the luck of sales or some other reasons behind a deep dive in P&L you might look for some other cost saving techniques. 9. No sufficient runway for taking off. Getting offshore engagement off the ground and getting it to the point it starts delivering value is not a trivial exercise. Do not expect immediate gratifications nor even start on that route if you have not enough runway (funds, time and energy), there is no glory in crash-landing. 10. No runway to land. No matter how skillful you are, how well financed is the project, how perfectly it is executed there is still a chance that your offshoring engagement fails. If that failure is likely to cause substantial damage, if there is no way you can safely terminate the engagement think twice before starting it. Of course many of these reasons and the items listed in Remi’s post can be dealt with, risks mitigated, and challenges addressed. Nevertheless you should not take any of them lightly and do not move forward with your outsourcing initiative till you take the last item off your Top Reasons NOT to Outsource list. Negotiations are an integral part of business life, that’s pretty much a truism. More so negotiations for business are very much like breathing for human beings. Sometimes it seems that you can not make a single step without getting involved in some kind of negotiations – project scope / resources / time / quality; multiple aspects of employment relationships; vendor relationships; customer relationships; and so on. So it’s no surprise that an ability to negotiate is one of those mandatory job requirements that somehow never make it to job description. While negotiation skills are important for any professional they are particular important and are put to real test when working with third parties and in particular with offshore. That’s why I decided to put a few posts to cover some of the most important elements of the subject. Offshore negotiations like many other ones often come down to drawing a line in sand demarcating what’s mine and what’s yours – reaching an agreement on resource allocation, responsibilities, financial aspects and so on. Negotiating in its isolated “pure” form is an ongoing and often major portion of communications through the lifecycle of the offshore partnership. It typically comes up first during the initial contract negotiations, possibly as early as signing an NDA and later comes up at every change in direction ort pace. What institutes a good negotiation? In a classic form a negotiated agreement is considered good if it is fair, wise, was reached efficiently, and is stable. I would a few more bytes to it – A negotiation went well if your interests are addressed, relationships are intact, you did not lose more than you gained in the process, you did not get more than you bargained for, and you feel good about it. What are the problems / issues? What are the affected parties? Identify high-level information pertaining to the negotiation for the all parties involved. Identify position of your opponents – their stated goals and objectives in terms of what they “want”. Discover true interests behind the positions of your opponents – their true goals and objectives or what they actually “need”. Identify the situation as it pertains to your negotiation power, timing and skills. Discover the same about the situation of your opponents, pressures they are under. Third step (time wise it could be preceding second step or done in parallel with it) involves defining your own position, your own “wants” and “needs”. As Seneca put it: “If a man knows not what harbor he seeks, any wind is the right wind.” Interestingly enough negotiating for the sake of negotiating is not such an uncommon event. Maybe an emotional rollercoaster of high pressure negotiations, blood taste in the mouth, or twisted pleasure of seeing your negotiation partner crumble to pieces is enough of a motivation, but what will it do for you in a long term? What exactly are we trying to achieve by the negotiations? What / Where / When / How do we want it? What / Where / When / How do we NOT want it? What is gained / lost by resolution? What are the achievement criteria? What are the alternatives that are available away from the table? What is your Best Alternative To Negotiated Agreement (BATNA)? What is gained / lost in case of no resolution? Exactly What / Where / When / How is BATNA manifested? Exit criteria. At what point do you stop negotiating and revert to BATNA? The fourth step, involves tactical and organizational actions for preparing to the “official negotiations” or the process of reaching the agreement. It involves obtaining negotiating authority, setting up negotiation team and addressing all logistic components. There is much to be said about setting up environment for negotiation, in particular in cross-cultural negotiations. Initial Discussion(s) – at this stage the parties typically outline negotiations landscape and share their “wants”. Regrouping / Final Preparation – at this stage the negotiating teams define / adjust their strategy and tactical approach. Reaching an agreement – the “face to face combat”, the heart of the negotiations. Paperwork – preparing and finalizing documentation pertaining to the subject negations. Closure – signatures, handshakes, and communications. Communications is one of the main factors in any sizable IT effort, and for offshore engagements it’s impossible to overstate the value and importance of it. How the communications are planned, maintained and controlled depends on variety of factors: size of the engagement, SDLC and project management methodology, organizational maturity on both sides, time zone differences, complexity of domain or technology just to name a few. The next thing is getting the plan to work. That is more difficult than it appears. Communications as any other process have a tendency to deteriorate unless enforced and controlled. Small ad hoc changes, canceling meetings for convenience or scheduling constraints, and focus of executive sponsors drifting away accumulate resulting in communications break down and a domino effect on multiple aspects of the engagement. That is a common problem across the industry and offshore only aggravates it. Consider steering committee / PMO structure or some other org structure with the sole / prime objective of governing the engagement. Audit activities, if size of the engagement allows, consider dedicated auditing group. Dedicated auditing is fairly expensive proposition, one of the easiest way of doing it using a third party perform the audits. Engaging outsourcing advisors for these activities could work out quite well. Consider a dedicated offshore manager; a person responsible for all aspects of the offshore activities. The person should have very solid PM/PMO skills, in-depth understanding of the processes such as SDLC, strong knowledge of the domain, and of course understanding of the offshore. Project Wiki and/or dashboard. That’s a great helper with relatively low support overhead. Some vendors offer such tools as part of their offering. I consider that big value-add. In case vendor doesn’t offer the out-of-box project dashboard you should build one using some open source wiki, Sharepoint or any tool you are familiar with. Time tracking. While not a communication tool and bane of existence for people on the team Time Tracking is unbeatable control tool that offers insights in the time allocation and forces you to communicate when any odd behavior is detected. IM tools with VoIP features, in particular I recommend Skype. The value of instant access to resources is difficult to overestimate. Open group chats using Skype or other IM technologies. A great way to stay abreast of what’s going on the project, pick up important communication breakdown clues, control information flow. There are plenty of great team collaboration tools starting with fairly simple ones like google docs or basecamp and all the way to high end enterprise style applications. The tools will not prevent communication breakdowns, they will help you control the flow and make them much less frequent and hopefully less damaging.